Crossing the Atlantic via cruise was once the only way to venture to America and foreign lands. Times have come a long way since the welcoming of passengers on board mail and cargo vessels in order to cross the Atlantic Ocean. Nowadays, it is much quicker to cross over to America and beyond by plane and some believe there is very little need for the transatlantic cruise. Thankfully, you can relive this experience and feel like a true explorer on board a Star Clippers ship; either sailing from or to the Caribbean and Europe. The authentic sails will make you feel like Christopher Columbus on his circumnavigation of the world and whilst there may not be a great deal in the way of amenities, a Star Clippers Cruise is organised around everything the great outdoors has to offer. Interested? We take a deeper look at what you can expect from a transatlantic, traditional sailing experience. Whether you decide to travel from west to east or east to west, there are a variety of cruises to suit you. Sailing from Europe will take you through the warmth of the Mediterranean before heading south to sunnier climbs; whilst the west to east will provide the opposite. Las Palmas, one of the Canary Islands, is a perfect place to start your transatlantic wind-sailing cruise. This island is a famous location amongst sailors looking for somewhere to stop either before or after crossing the Atlantic. After exploring the volcanic crater, prepare to say goodbye to the land as you embark on the sailing journey of a lifetime. With 13 full days at sea, be prepared to kick back and relax on the traditional Star Clipper sailing ship. This tall sailing ship will make your days at sea every bit as enjoyable as your time on the shores. Whilst marvelling over the fantastic, panoramic views you really can escape from all of the troubles of the land. Find a sun lounger and read a book; cool off in the pool; or even climb the mast and appreciate the true beauty of a sailing ship. Most large cruise ships will prevent access to such areas – but this is not the case with Star Clippers! Deck games and lectures will add a sense of variety to your days at sea, and activities often include bizarre events such as crab racing contests. Additionally, you also have the option to help the crew with the sailing of the ship at set times. Who knows, you may get to steer the ship for a period of time – making for a truly unforgettable experience. The service and food on board your transatlantic cruise is second to none and you can look forward to delights such as buffets that include, fresh seafood, a la carte options and fine wine. You can freely talk to the captain or head officer on board, who will respond courteously and assist with any queries you may have. 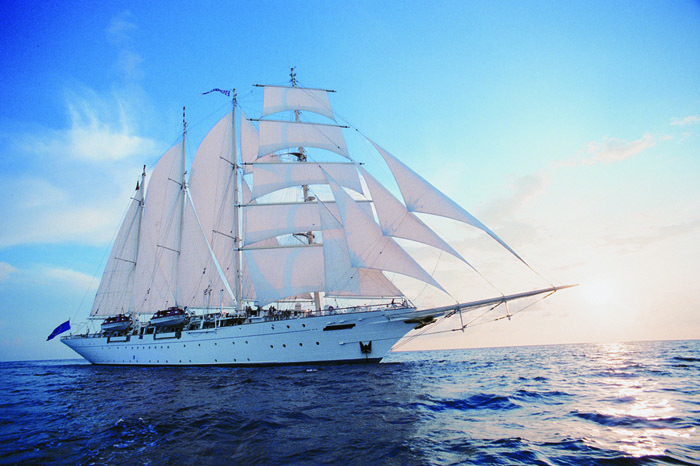 Star Clippers provide the modern features you would expect from a cruise, but mixed with traditional and adventurous sailing methods. The small Caribbean island of St Marten (or St Maarten) greets you as you reach the other side of the Atlantic Ocean. This truly mesmerising journey, allowing you to experience the beauty of the sea is epitomised by the first sight of land on the other side. A culture that combines elements of French and Dutch greets all visitors to the Caribbean island which has a great shopping reputation. Place your feet on the land once again and you won’t believe you've spent the last 11 days traversing the Atlantic Ocean. But, this only one of many transatlantic ocean cruises you can take with Star Clippers. Whether you want to: mingle in the Eastern or Western Mediterranean, cruise in style through the Caribbean, or perplex yourself over the sheer engineering brilliance that is the Panama Canal - Star Clippers provides a wide range of truly traditional wind-sailing experiences unlike any other.